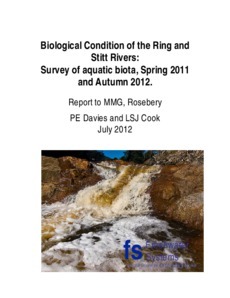 This report describes the results of surveys conducted in 2011/12 in the Ring and Stitt Rivers, comprised of one spring 2011 and one autumn 2012 seasonal sampling event for macroinvertebrates and fish. This report forms part of what is now a routine biomonitoring exercise for the Ring and Stitt catchments. Surveys under this program have been previously reported for autumn and spring annually from 2005/06 to 2010/11 (Davies et al. 2005a, b; 2006a, b; 2007; 2008, 2009, 2010, 2011). These had been preceded by a detailed survey conducted in 2003/04 (Davies et al. 2004).